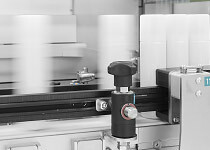 Rely on leading industrial robots that comply with your requirements. Configure your palletizer based on a modular concept. Based on your needs, choose from a single-station palletizer to a fully automatic palletizing system. The single-station palletizer handles low-performance tasks within a compact space. This state-of-the-art robot technology used a thousand times all over the world ensures the highest machine availability capable of low life-cycle costs throughout the machine runtime. Efficient two-station palletizer for a simple integration into any line. Intelligent technology and ergonomics, offer optimum operating safety and comfort. Benefit from the highest machine availability with two pallet stations that ensure a pallet change without any line downtime. Trust in our four-station palletizer with superior operating comfort. The pallet magazine is integrated with a transfer system for fully automatic pallet handling. Trust in our strongest four-station palletizer with superior operating comfort. Reliably palletizes heavy loads, up to 40 kilograms. The user-friendly pallet magazine with integrated transport system offers fully automatic pallet handling for unattended production.